Watching an art and music improvisation session reminded me of the various collaborations I’ve had with artists in London, Utrecht, Crete, and Brugges. It’s about the process. As a finishing touch to my recent application for an innovation grant, I asked the Maui-based artist Mike Takemoto if he would consider having his students collaborate with mine. I was thinking along the lines of an exhibit of paintings of musicians, music instruments, or music notes. It would be an extension of the piano ensemble poster exhibit that I “curated” and organized with the photography teacher Harvey Reed and his photo and design students last spring. Such interdisciplinary collaboration raised awareness of the activities we wanted to promote. Music: a hobby or a profession? I complained that I have to make enough income to show that it’s not a hobby. So far, the expenses are way too high. How can we say we’re professional musicians when it costs more to do it than to sit at home and do nothing? Another way to look at it is to consider these activities as investment. They are necessary to scope the market. I had an interesting conversation with our painter this afternoon. He has a portfolio career of teaching karate, sociology, and painting. Presumably being a sociologist pays the most. Karate keeps him fit. And painting? Whenever there is a demand for it. As I’m doing my taxes right now, I complained that I have to make enough income to show that it’s not a hobby. So far, the expenses are way too high. Last year, we went to Seville, Madrid, La Coruna, Ferrol, London, Paris, and Crete, not counting Venice, Florence, Rome, Dusseldorf, and Helsinki where I went without Robert. Robert worked on a flamenco guitar project in Seville. 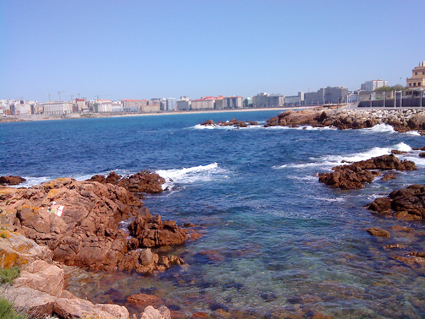 We gave concerts in Madrid, La Coruna, and Ferrol. We went to London to check and relet my house. We took the train to Paris for a long weekend of inspiration. We spent a week in Crete, in an artist residency which culminated in an exhibition and concert in Brugge earlier this year. We got a grant from a Dutch foundation and airfare from a Spanish electricity company for a concert. The airfare enabled us to give the one concert (on the way) which actually paid us cash. Airfare, accommodation, and living expenses were paid for the week in Seville, but no other income. How can we say we’re professional musicians when it costs more to do it than to sit at home and do nothing? Our painter said that he would most definitely get paid more if he was on a university payroll. But he could not conform. He preferred to freelance as a sociologist and accept the uncertainties of cashflow. We too have to accept this income uncertainty if we want to be flexible. [See future blog about uncertainty and flexibility.] If there were an orchestra or an outfit or a conservatory or an institution that would hire us and pay us to do what we normally do, we would probably get paid more than our expenses. Does such an institution exist? Pay us to fly to Seville, Madrid, La Coruna, Ferrol, London, Paris, and Crete? Author BLOGmaidenPosted on August 30, 2010 August 31, 2010 Categories economics, travelTags cashflow, Crete, Dusseldorf, economics, expense, Ferrol, flexibility, Florence, Helsinki, hobby, income, investment, La Coruña, London, Madrid, music, Paris, portfolio career, profession, Rome, Seville, tax, taxes, travel, uncertainty, Venice6 Comments on Music: a hobby or a profession? Participants of Levka Ori Creative Encounters in 2008 and 2009 finally meet in 2010 to share their experiences and exhibit their work. Watch the video of Dorit Drori and see the photo of Robert Bekkers. 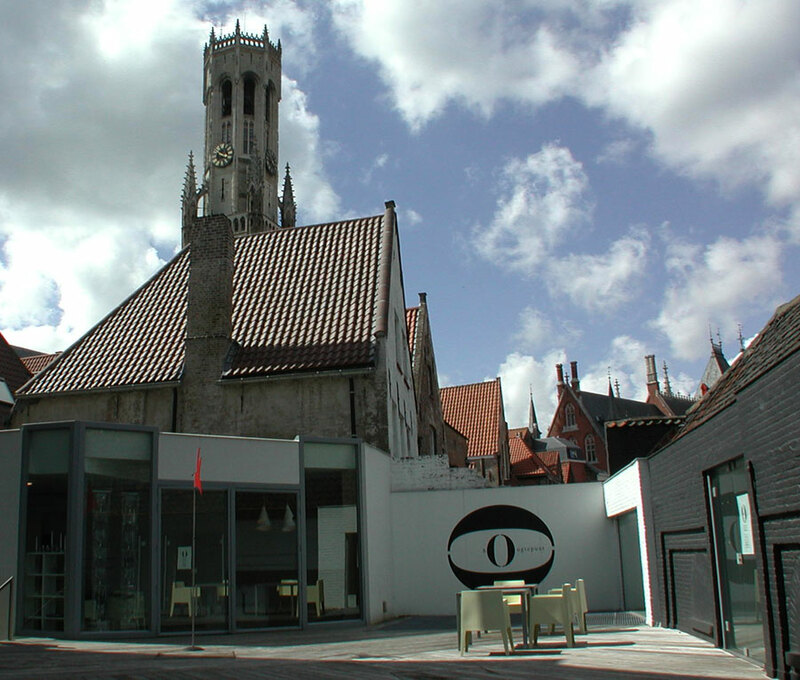 The current exhibition at Artonivo art centre in Bruges (Brugge), Belgium shows several videos on the big screen. 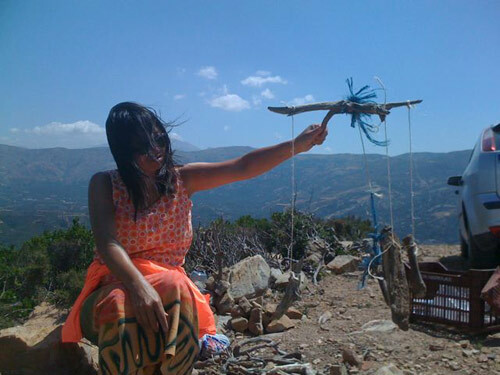 I witnessed the making of Robert Bekkers’ wind guitar high above Paleochora, Crete. I hope it will be available soon to share with the world in cyberspace. During the busy evening of 26th February 2010 when the exhibition opened, I didn’t get to watch closely or hear the accompanying guitar music of Israeli artist/photographer Dorit Drori’s video until now. 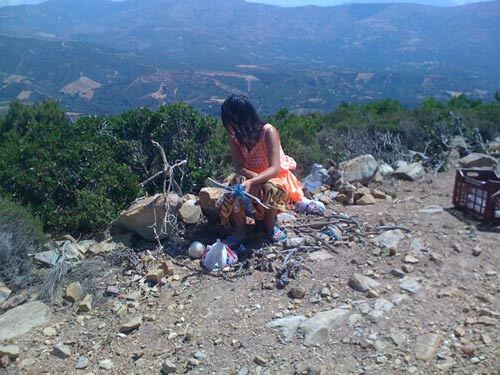 Dorit had participated in the 2008 Levka Ori Creative Encounters on Crete project, just a year before ours. Had we gone in August 2008, we might have produced something different for the exhibition. Perhaps Robert might have played the guitar that accompanied her video. Alternatively, Dorit might have filmed Robert playing his guitar in the wind. There was no overlap between August 2008 and August 2009. We didn’t meet Dorit until Friday 26th February 2010. We could not have collaborated before then. Interestingly you could say that we are now collaborating in hindsight. 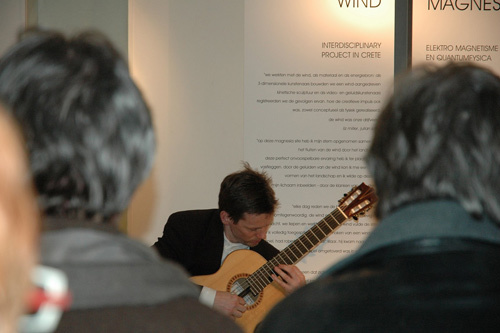 Below is a photo Dorit took of Robert Bekkers performing live music on the opening night. And I’m just discovering the works of Dorit Drori through her websites and videos…… and blogging about it now. Half a year later, I wrote a short text on creativity and economics for exhibition at the Artonivo art centre in Bruges, Belgium. The owner, Fernand, considers the exhibition his personal hobby, i.e. to bring creative people together and display their work. The gallery is open from 15:00 to 18:00 every day until 5th April 2010. I was reading “Freakonomics” on my way from Amsterdam to Crete last August (2009). I wanted to talk about it with the other participants of the 14th Levka Ori Creative Encounters in Crete. But they were more interested in creativity than economics. While I struggled with creativity, the other participants actively created. While I argued about the economics of creativity, the others expressed their creativity in different ways. 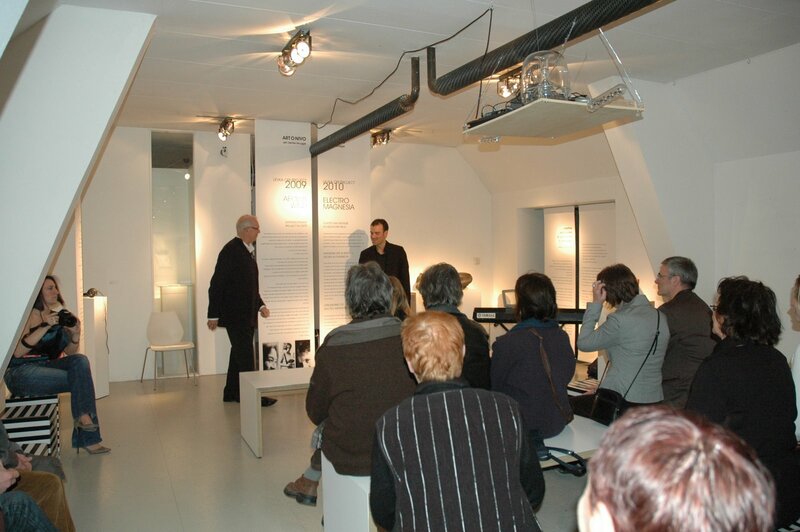 On Friday 26th February 2010, Robert Bekkers and I officially participated as artists in a new exhibition. 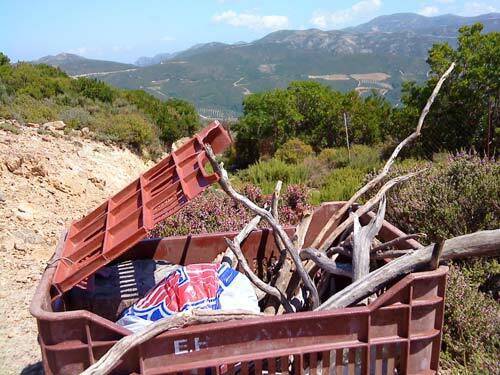 It was the result of our week of “Creative Encounters in Paleochora, Crete” in August 2009. The exhibition covers the interdisciplinary projects of 2007, 2008, and 2009 spearheaded by the owner of the Artonivo Gallery. GAEA AEOLUS or AARDE WIND or EARTH WIND exhibition runs daily from 15:00 to 18:00 in Artonivo art centre in central Brugge (Bruges), Belgium until 5th April 2010. There is a first time for everything. As musicians, we give concerts (foreground music) or play background music. Rarely do we get a chance to play foreground music and linger on (without being there) for two months. On Friday 26th February 2010, Robert Bekkers and I officially participated as artists in a new exhibition. 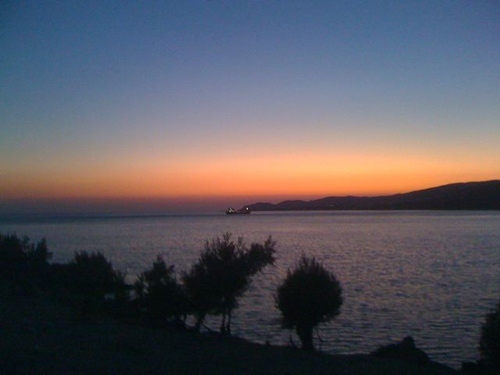 It was the result of our week of “Creative Encounters in Paleochora, Crete” in August 2009. The exhibition covers the interdisciplinary projects of 2007, 2008, and 2009 spearheaded by the owner of the Artonivo Gallery. I had gone to many private viewings in London and Amsterdam as a spectator but never as a participant. That Robert Bekkers and I would have something to exhibit was a completely new experience for us. As precaution, I had suggested a concert — something we knew well, in case we had nothing worthy to exhibit. 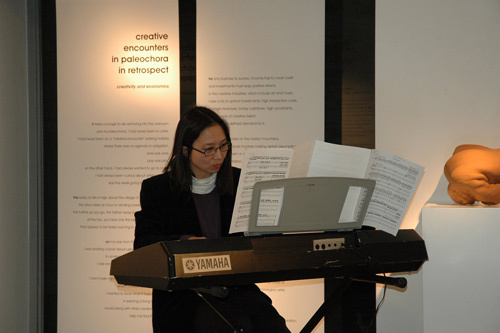 An electric piano made a live performance possible. However, memories of playing on an electric piano in Capetown’s Victoria & Alfred amphitheatre in South Africa warned us against trying anything too fancy. I began with a piece for violin and cello. It seemed appropriate to play “Encounter” with the left hand as cello and right hand as violin, for the project was called “14th Levka Ori Creative Encounters in Crete.” I explained the programmatic aspect of my composition about a conversation between two strangers. I will write about our improvisation in another blog. It deserves a separate blog. We had never performed an improvisation in public until then. But that’s how we met, or rather, how Robert and I were supposed to have interacted — in an improvisation ensemble in Amsterdam in Spring 2001. Except, it didn’t happen. I sat in the audience instead. That’s definitely another story. We ended the short concert with Vivaldi’s WINTER for it conjures up the wind and the elements. So happy I was to see three familiar faces from the Netherlands. They had come to support us — or perhaps out of curiosity. 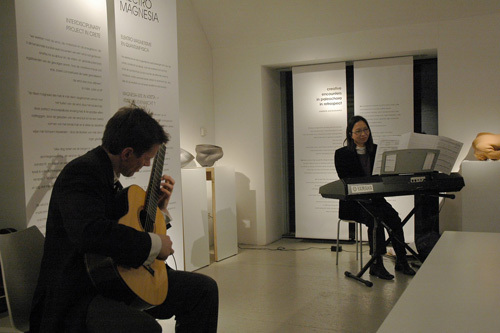 What were musicians doing in an art gallery? What were Netherlands-based musicians doing in Belgium? Over champagne and sandwiches we chatted with the guests. We got to know the other artists who had gone to Crete before us. Two sisters Ruthi Dekel and Dorit Drori had gone in 2008 whose theme was Archaelogy of the Imagination. I am grateful for Dorit’s photos displayed here. GAEA AEOLUS or AARDE WIND or EARTH WIND exhibition runs daily from 15:00 to 18:00 in Artonivo art centre in central Brugge (Bruges), Belgium until 5th April 2010. When musicians and visual artists collaborate, ultimately there is an intersection of time and space. How does one condense a year of time into a physical space? Our exhibition entitled GAEA AEOLUS, the result of that one week of “Creative Encounters” in Paleohora Crete, will open at 8 pm on 26th February 2010 in Brugge. There will be an electric piano. It will be a surprise. Musicians work in the dimension of TIME, while visual artists deal with SPACE. When musicians and visual artists collaborate, ultimately there is an intersection of time and space. How does one condense a year of time into a physical space? After the EFFUSION house concert, the film maker Julian Scaff invited us to a one week working holiday on Crete. It was the 14th Interdisciplinary Meeting of Artists at Levka Ori. There were no obligations. However, if we did create something, we could get it exhibited in early 2010 at the art gallery of the founder of this annual project. We’d pay our own way, arrange our own stay, and meet daily for “creative encounters.” I was curious. We had nothing to lose but everything to gain. So we went in August 2009. I began a blog of Paleochora. Every day we drove up the mountains. What was omnipresent was the wind. In fact, the wind AND the sun competed fiercely for attention. We walked and worked alone. The wind filled the silence. When the sun grew too hot, we retreated and returned when it got cooler. It was inconceivable to give a concert in Paleochora (the way we’re used to). 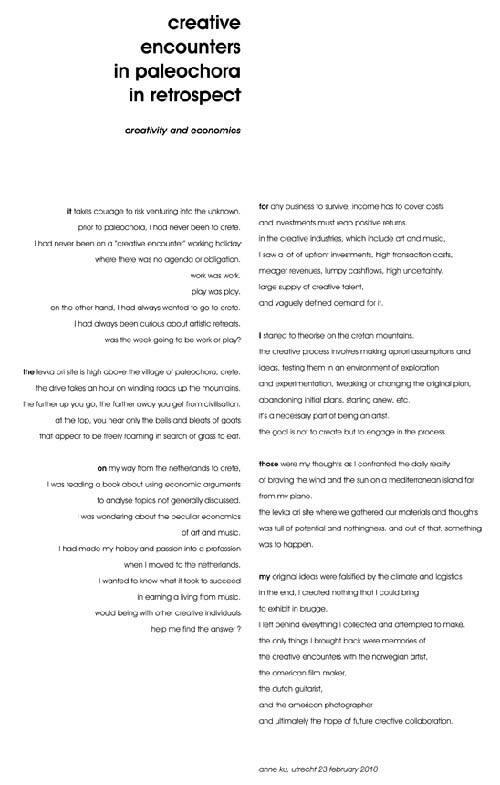 What could we, as classical musicians, possibly achieve by being far away from our instruments and environments? The “creative” part of the encounter occurred after we headed down the mountains and met for dinner. There we introduced ourselves and shared our ideas. I decided to give up trying to find a piano. Instead, I’d collect items to make musical instruments. I imagined making a wind chime out of twigs and branches. I envisioned making percussive instruments out of pebble-like goat deposits. I crouched on my hands and knees and collected what I could find. While I was completely focussed on making my wind chime, Robert had finished his “wind guitar.” He came to me and saw that my wind chime was turning into a mobile. The twigs swung in the wind but did not touch. There was no chime about it. But this gave him an idea of making a wind harp. Later I abandoned the goat deposits as they crumbled in the moist plastic bag in our hotel room. I had created nothing feasible or substantial. What am I going to exhibit at the ARTONIVO art gallery in central Brugge (also known as Bruges) next Friday? Our exhibition entitled GAEA AEOLUS, the result of that one week of “Creative Encounters” in Paleohora Crete, will open at 8 pm on 26th February 2010 in Brugge. Everyone else has got something to show. What will I do? Luckily there will be an electric piano. It will be a surprise.